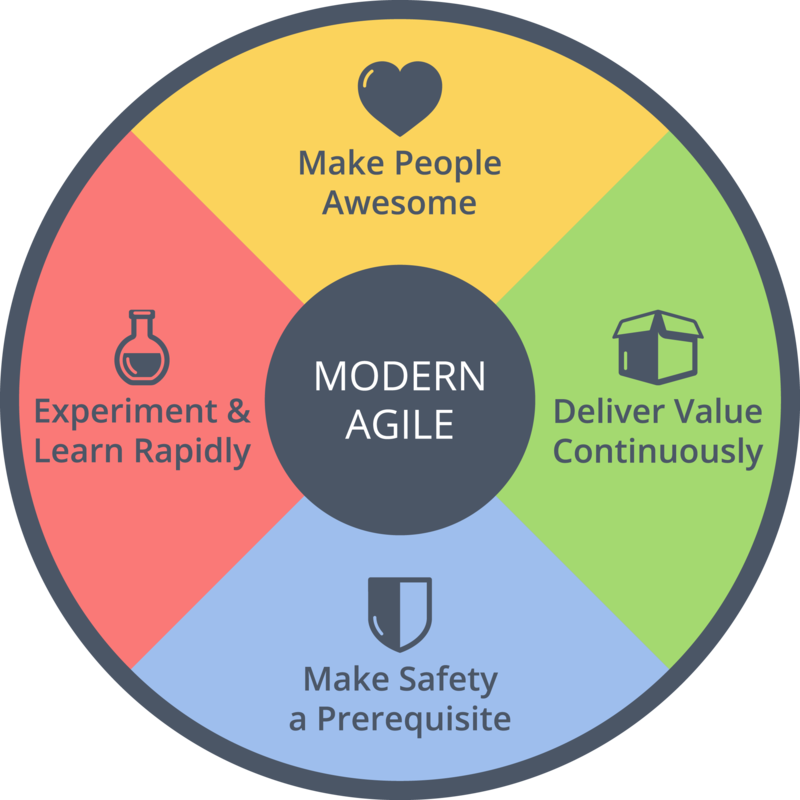 At the recent Agile 2016 conference in Atlanta, Joshua Kerievsky, CEO of Industrial Logic and author of "Refactoring to Patterns" gave a thought-provoking keynote around the idea of Modern Agile. He began the talk with an overview of Modern Agile, which he created for the community and as a result is open source, including the graphics and the font. It is getting a little old, it has had a wonderful lifespan, it is a distinguished part of our history and it deserves an honourable retirement. Kerievsky referenced a number of books that have influenced Modern Agile including "Badass: Making Users Awesome", "Managing For Happiness", "Delivering Happiness", "Kanban", "Continuous Delivery", "The Lean Startup", "The Startup Owner's Manual", Lean UX", "Agile Retrospectives", "Driving Fear out of the Workplace" and "The Power of Habit". Another influence is the two pillars of the Toyota Production System and they are built into Modern Agile: Respect for People and Continuous Improvement. He stated that whilst he did not set out to update the Manifesto for Agile Software Development, he believes that we are no longer just "uncovering better ways of developing software by doing it and helping others do it"; rather we are doing lots of things with Agile and are focused on outcomes, so we are actually "uncovering better ways of getting awesome results". He then took a deep dive into the each of the principles. Making people awesome is about thinking about the entire ecosystem; not just users but evaluators, salespeople, managers and buyers. In relation to making safety a prerequisite, he shared the results of the Google Project Aristotle study that showed that the number one attribute for a high performing team was psychological safety. If you have a culture of fear none of your fancy practices or processes will help you. Experiment and learn rapidly is about being able to "rigorously extract value from failure" and practising fast feedback cycles. Deliver value continuously is about doing the impossible and delivering 50 times a day and making it safe to deploy. This includes moving from quality assurance to quality engineering, from sprints to continuous flow and from manual builds to continuous deployment. Kerievsky then shared some case studies of Modern Agile including Osteria Francescana, Etsy (Three Armed Sweater Award and blameless retrospectives), Hunter (Mob Programming), Airbnb (deployment as part of onboarding and real time business metrics) and Amazon (Fire Phone failure). "Customer Collaboration over contract negotiation" be replaced by "Make People Awesome"
"Working Software over comprehensive documentation" be replaced by "Deliver Value Continuously"
"Responding to Change over following a plan" be replaced by "Experiment and Learn Rapidly"
"Individuals and Interactions over processes and tools" be replaced by "Make Safety a Prerequisite"
The video of the keynote is now available from the Agile Alliance. InfoQ also interviewed Joshua Kerievsky about Anzen and Safety in Software, one of the four principles of Modern Agile. I've heard the need to rewrite the manifesto raised many times in the last few years. This is the first time I've nearly been convinced. The essence of the principles are right. The proposed language could use some work.